What is more vivid and earthly than death? It is very easy to represent death as the landing place of a process, as we can see in many works of art of the Western world. One thinks of the Death of Marat painted by Jacques-Louis David in 1793 ðfig. 1Þ, where the wan body of the revolutionary man, with a visible wound on his chest, lies in his bathtub just after his murder. 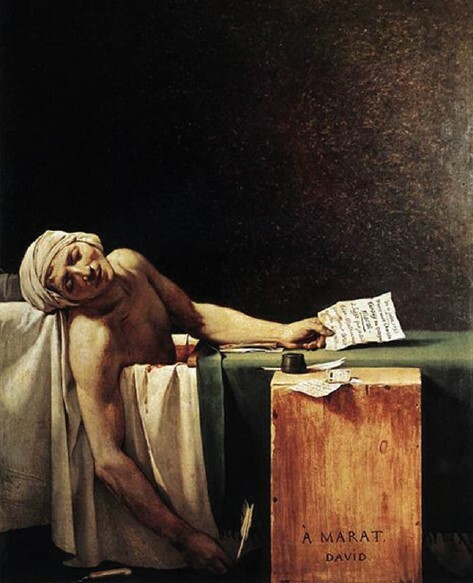 The bloody dagger, abandoned by the killer, Charlotte Corday, lies near the leaning arm of Marat. Jacques-Louis David, Death of Marat, 1793, oil on canvas, Musées Royaux des Beaux-Arts, Brussels. day, lies near the leaning arm of Marat. This is one of the most popular representations of a dead body, which is directly linked with the Entombment of Christ by Caravaggio (1602–3) for the position of the arm in the foreground. David introduces the quotation from Caravaggio to sublimate hispolitical hero into an “alter Christus,” a new unreligious martyr. Nevertheless, both artists painted the body of the two protagonists—Jean-Paul Marat and Jesus Christ—as seen soon after death. We can see corpses in various works of art of different ages and different subjects, religious or not: battles, wars, depositions, entombments, Pietà, slaughters of the innocents, and many others. A dead body itself does not involve problems of representation of transcendence. If, however, death is meant not as an ending point but as a transformation, a transition between life and afterlife, the theoretical problem is more complex. Climax is the moment of maximum tension—an instant infinitely short—and, concentrating on it, the artist summarizes the two extremities of the action, “before” and “after” ðCalabrese 2006cÞ. It is an excellent expedient to introduce the passing of time in the still medium of painting ðCorrain 1987Þ. Even photography has the same semiotic problem. The famous picture Loyalist Militiaman at the Moment of Death ð1936Þ by Robert Capa shows the effect of shooting on the body of an anarchist during the Spanish Civil War.4 Looking at this work in 1954, Louis Aragon admired the incredible ability of his friend “to capture forever, thanking his camera, the thin line between life and death” ðWhelan 2001Þ. Because of the exceptional nature of this picture, it was supposed not to be a live shot but the result of a mise-en-scène sought after by the Hungarian photographer. Nowadays, after long research in local archives and interviews with veterans this interpretation has been demolished, and it has been confirmed that this picture was taken exactly in the instant of shooting.5 The militiaman did not pose for this photograph, and Capa came incredibly close to the point of no return, the climax of the action. Getting back to painting, the iconography of Crucifixion is one of the most vivid examples of the challenge of representing the infinitely short instant of passing away. In different ages artists have tried to approach the final act ðthe climaxÞ, emphasizing some important signs of suffering, such as tension, contortion of the body, and pale skin tone ðCalabrese 2006bÞ, characteristics, among others, of the famous Grünewald Crucifixion ðfig. 3Þ. Indeed, the representation of the moment of death is a problem of passions, “because it involves a certain aspectuality of suffering ðinchoateness of agony, punctuality of the act of dying, durativeness of being deadÞ” ðCalabrese 2006a, 101Þ. The aim of this article is to demonstrate that the real subject of this work of art is the representation of a nonrepresentable transcendence, the passage from life to afterlife: the meaning of Death does not lie properly in its feature but in its function, because it acts as an agent of transformation between two realms.9 Also, the Crucifixion leads to the hereafter, but it concerns the life of the Son of God as an exemplum for everyone. In the Buffalmacco fresco, on the other hand, the transition acts from the life of humankind to its future salvation or damnation. In both cases death is meant as a transformation, but while the Crucifixion shows it in the climax of the suffering Christ,Buffalmacco shows it in a very complex arrangement of spaces and times. 3 What Is Written Here? In order to understand the Triumph of Death it is necessary to be reminded of its original destination: the Camposanto of Pisa, the monumental cemetery built in the Piazza del Duomo after the Cathedral, the Baptistery, and the Leaning Tower ðBaracchini and Castelnuovo 1996Þ. It was commissioned by the archbishop Federico Visconti and was begun in 1277 by the architect Giovanni di Simone. It is a roofed-over building, because it was conceived of not just as the burial place of important people but also as the storage for Roman sarcophagi gathered around the cathedral in the early Middle Ages ðCarli and Arias 1937; Settis 1984Þ. The Camposanto has a rectangular shape with a central courtyard and four galleries all around. As we can see from the map ðfig. 5Þ, along the inside walls of the galleries different artists realized the largest cycle of frescoes of the time: it is a well-structured program, composed of different subjects coming from the Old and the New Testaments, the lives of local saints, and two interesting “exceptions.” The pictorial decoration of the Camposanto started with the local painter Francesco Traini ðCaleca 1986Þ. Around 1330 he was asked to fresco the great Crucifixion ðfig. 6Þ behind the altar, where religious functions were celebrated at the beginning of the fourteenth century.10 Inside this building Traini did not execute more than this fresco. In fact, the Florentine Buffalmacco, a friend of Giovanni Boccaccio and Franco Sacchetti and protagonist of some of their tales,11 was probably invited to realize three stories of the life of Christ after death on the left side of Traini’s painting: Resurrection, Incredulity of Saint Thomas, and Ascension of Christ ðfig. 7Þ. On the other side of the Crucifixion, on the southern gallery, Buffalmacco painted the most famous and largest cycle of frescoes of the Camposanto: the Triumph of Death, the Last Judgment ðfig. 8Þ, and the Thebais ðfig. 9Þ, showing several episodes from the lives of the Holy Fathers in the desert. The Triumph of Death and the Thebais are the iconographic “exceptions” of the whole program; in fact, these stories are taken neither from the Old and the New Testaments nor from the lives of saints. Many other painters followed, and the main decoration ended with Benozzo Gozzoli, who worked in Pisa for almost twenty years in the second half of the fifteenth century.12 The high humidity of the place and the exhalations coming from the graves seriously damaged all the frescoes inside the Camposanto, which has been continuously restored and partially altered. Since the beginning, the graveyard has been a never-ending workyard. Between the eighteenth and nineteenth centuries the Camposanto became a favorite place of travelers, and we have a large number of descriptions in literature and the figurative arts.13 In 1812 the scholar Carlo Lasinio ð1759–1855Þ etched all the frescoes in forty plates,14 intending to record their status, but obviously giving his own interpretation to these works of arts. Lasinio drew every single story, avoiding reproducing the frames painted around each one of them. Entering the Camposanto before July 27, 1944, we would have found the wide painted surface of the Thebais on our right hand ðfig. 5Þ. Walking along the gallery, seeing the Crucifixion in front of us, we would have reached first of all the Hell with the Last Judgment, and then the Triumph of Death. Apart from the Crucifixion, the narrow gallery did not allow a frontal general view of all the frescoes, and the viewer had to concentrate only on single episodes ðCaleca 1996Þ. This cycle was conceived by Buffalmacco to be seen in this way because he decided to use all the space available, without dividing it in two stories as he did on the eastern gallery for the Resurrection and the Incredulity of Saint Thomas. This interesting morphological choice invites us to examine the relation between the movement of the beholder and the architectural space of the gallery in connection with the medieval conception of time and space. Buffalmacco arranged the stories of Christ after death in order to let the beholder have a complete overview in spite of the narrowness of the gallery. But why did he not make the same choice for the cycle of the Triumph of Death? Probably one of the answers is Buffalmacco’s unusual subjects. The audience of that time was used to recognize the Resurrection, for example, as a singular scene with a specific iconography, isolated from the other episodes of the New Testament. The same audience was not equally familiar with the advent of death and its consequences, neither with the episodes of the Holy Fathers in the desert. At this point the movement of the beholder becomes crucial, because this part of the southern gallery was a sort of nave with the main altar underneath the Crucifixion. Several processions of Flagellants’ brotherhoods are documented in the first half of the fourteenth century, and the faithful walked along the nave from the Thebais to the presbytery, thus having a partial view of singular episodes.16 The peculiar architectural space and its religious function suggested to Buffalmacco to set several stories in different places, where various groups of people play a single act of the whole drama. Present time echoes metaphysical time; and the Triumph of Death represents both, arranging the external world in the lower level and the transcendent world in the higher level. This is very clear from looking at the historical photograph, because it is the only way to get a general overview, otherwise impossible. In fact, the faithful, just as the modern visitor, could only get a view of groups of characters or “squares,” starting from the so-called Three Dead and Three Living ðfig. 11Þ, on the very left side of the Triumph. Here is depicted the durativeness of death: a group of twelve young noblemen, riding horses during a hawking expedition, meet three corpses in different stages of decomposition.17 The corpses lie in superimposed coffins showing the ravages of time: the first corpse, most recently dead, shows a fresh-skin face and is smartly dressed with an elegant hat and footwear; the second wears a crown, being probably a king, and its appearance looks very deteriorated; the third is already a skeleton and lies very close to the beholder, turning the gaze toward him. In the central scene a group of beggars ðfig. 12Þ invokes the personification of Death, hanging in the air not so far from them. They turn their back on the preceding scene ðThree Dead and Three LivingÞ and orient their gestures, gazes, and a long scroll to the right side,18 with the following rhymes in early Italian: “Because prosperity has left us / Death, cure for every pain, / Come and give us the last supper!”19 This part of the fresco acts as a turning point, and it is marked also by a rocky landscape ðfig. 13Þ. At the foot of the triangular cliff of the mountain various corpses are amassed. They are not anonymous, because we can recognize their genders and social status: men and women, a doctor, a monk, a merchant, and a bishop, among others.20 Some of their souls, represented in the shape of a baby, are drawn from their mouths by two devils and one angel, who fly right underneath the personification of death. On the very right side of the fresco, seven young women and three men ða strange similarity with the Decameron brigadeÞ enjoy themselves in a delightful garden of orange trees;21 an elegant tapestry of flowers is placed at their feet. They wear fashionable clothing; they talk to each other and play music, while the horrible figure of Death arrives on their left side with an unmerciful scythe. This is a complex figure, half human and half devil, not a skeleton: she looks like an old woman with long white hair, bat wings on her back, and claws on both feet and hands.22 We are not allowed to know whom she is going to cut down among the group of young people. Two cupids fly over their heads carrying a torch of love upside down, and this is a certain presage of misfortune. The whole brigade is unaware and happy; none is suffering at all, because the scythe is still waving in the air: it is near but has yet not arrived. Here is represented not the punctuality of the act of dying—as, for example, in most Crucifixions—but the inchoateness of the act of cutting down, which the old woman is just about to do. The Triumph of Death is a complex combination of images and words ðin early Italian and in LatinÞ. Scholars think that this composite system was meant to build mental images able to influence and shape the faculties of the soul, reelaborating an Augustinian conceptual scheme ðBolzoni 1996Þ.27 For this reason, the theoretical plan of the fresco was attributed primarily to the Dominican theologian Cavalca ð1270–1342Þ, the author of important sermons in the vernacular ðBolzoni 1988, 1996; Frugoni 1988Þ.28 Buffalmacco, together with Cavalca and the other Dominicans who planned the cycle, addressed a differentiated audience composed of three categories: illiterates, learned men who could read early Italian, and those who could also read Latin ðBolzoni 1996Þ. That being said, it is interesting to examine the montage of words and images from a semiotic point of view.29 It is well known that language has a different status compared to visual images, and in this respect these two semiotic systems interact in a very prolific way. So we must investigate the relation between painting and writing, with particular attention to both levels of writing: its visual aspect or the form of the sign ðsignifierÞ and its content ðsignifiedÞ.30 Unlike the above-mentioned painted scrolls, held by characters in some episodes of the fresco ðthe anchorite and the beggarsÞ, a long inscription is shown by two angels, looking like cupids floating in the air. They are “inside” the painting, but they are not part of any episode of the fresco. Also, they are inserted in a very significant place, in the corridor where Death and her companions descend to the corpses and rise up with the damned souls. If we look at the anchorite, his long scroll has an important function inside the painting, not only for the inscription that it bears: the diagonal scroll creates a kind of extension of the footpath, but it also plays an active role in the visual narration, connecting two different loci; and the direction of writing from left to right marks the same aspect. These words offer an interpretation of the whole fresco realized by Buffalmacco. Furthermore, from a visual point of view, this scroll is very different from the others and appears to function like a book cover or, better, an epigraph. This aspect is also marked by the explicit appeal to the reader, which can also be found in other inscriptions. The historical pictures show all around the Triumph of Death several figures with scrolls peeping out from the frame. These figures are inserted in a framed rhombus on each horizontal side: nine angels on the lower margin and seven figures on the higher margin; but at this level we can only recognize a skeleton and three men, two of them probably sacred characters. Unfortunately, as we have already said, after the fire of 1944 the fresco was detached from the wall without its frame, and today only small fragments of it remain. These writings vanished at a very early stage because they were exposed to open air, but in 1899 the philologist Morpurgo tried to reconstitute them, thanks to a fifteenth-century transcription.35 Morpurgo also compared the Renaissance text with the faint traces still readable on the wall of the Camposanto. On this basis, scholars have recently reconstructed the verses and their arrangement inside the scrolls of both frames ðFrugoni 1988; Bolzoni 1996Þ. Until now we generally thought that the inscriptions on the higher margin were all in Latin, while the ones in the lower margin were all in the vernacular. Another important source—unknown to Morpurgo and never quoted in the essays about the Buffalmacco’s Triumph of Death—suggests a revision to this interpretation. In a letter dated 1561 Cosimo Bartoli made a transcription of those verses at the request of his friend Giorgio Vasari, who was working on the second edition of the Vite.36 Bartoli spent several hours trying to decipher all the writings of the fresco, and his version shows many variants compared to the fifteenth-century tradition, starting from the coexistence of early Italian and Latin in the lower frame. On the opposite side, the inscriptions were probably all in Latin, although Bartoli could not read them and Morpurgo could only read the two strophes at the end of the nineteenth century. Each strophe was held by the first two figures on the left side: a skeleton ðwhich says the words “Primus natus Abel et primus mortus”Þ and a young man, probably an angel ðwho responds “Primus natus Kain, primus homicida”Þ. As we have already said, the lower frame contains writings in the vernacular and in Latin.39 Primarily, this fact forces us to get back to the audience of the fresco, because language here did not necessarily select two distinct audiences: vernacular and Latin are complementary, not alternative to each other. Subsequently, these writings are not captions but rather are voice-overs, that is, they give voice to different characters of the fresco, establishing a dialogue with the learned beholders. The strophes are long, the verses refined, and their meanings need a high level of attention. Thus they have a complex literary and theoretical structure. The long life of the fresco, its continuous restoration, and the insertion of several sepulchral monuments or memorial tablets in the lower part of the wall make the reading of these inscriptions very difficult. The following reconstruction, based on our comparison between Bartoli’s and Morpurgo’s transcriptions, offers a new interpretation of the writings. In particular, proceeding from left to right, the first three scrolls were not visible to both scholars,40 and Morpurgo extracted them from the fifteenth-century codex.41 The first one praises the hermitical life, and it refers to the episode of the anchorites. The second and the third give voice to one of the three corpses inside the coffins, and they talk to the noblemen and also to the beholder. The fourth scroll, under the greyhound, recalls the transience of life and warns everybody about the fleeting nature of richness. The fifth, under the beggars, is in Latin, but even Bartoli could read these fragments of verses that can be interpreted as a supplication to death, echoing the longer inscription held by the same beggars inside the fresco. The sixth scroll is just under the heap of corpses, and its writing alludes to death as a leveler of different classes;46 however, it speaks without distinction to rich and poor, because death concerns everyone who was born. The seventh scroll is once again in Latin, and the three verses that Bartoli copied sound like a parable about the unpredictable arrival of Death. The eighth scroll addresses a woman in the orchard as well as every woman in the audience, inviting her to shun vanity and hedonism. The ninth and last scroll—already not readable in Bartoli’s time and drawn from the fifteenthcentury codex—exhorts everybody to avoid carnal sin because Death could arrive at any moment.50 We are talking about a literary treasure of at least fifty verses entrusted to the lower frame. In the Vasari description of the Triumph of Death the frame is called ornamento ðdecorationÞ, and this term indiscriminately appears in the Vite indicating architectural motifs or frames ðmostly in wood or oils on canvasÞ. This linguistic use, widespread in Renaissance times, combines in the same function elements that are apparently different: the frame is meant to be not just a material object but also a theoretical value. Within such a perspective, the frame involves aesthetic reception in different ways. The perceptive level comes in: when not being viewed, the frame allows the gaze to concentrate on the representation without dissipating.51 Contemporary art theory hardly considers the aesthetic and epistemic role of the frame, a border that divides in a very complex way the space of representation from everything that does not concern it.52 The frame is a dense limen ðthresholdÞ, whose task is to be gazed upon without being seen; it is a limit of aesthetic character, embodying the problematic distinction between the space of the work and the space external to the work. In which terms is this distinction problematic? Following Louis Marin’s theories, the frame connects two different spaces: the represented one ðmimeticÞ and the one of the self-presentation of the image. In order to understand this concept, one of the first definitions of the verb “to represent” is “to substitute something present for something absent ðwhich is of course the most general structure of signsÞ” ðMarin ½1994 2001, 352Þ; this substitution is ruled by a mimetic ratio. If the mimetic dimension prevails, the work of art seems to be able to speak by itself, creating an “effect of objectivity.” On the contrary, if the presentative dimension prevails, the work of art shows the mechanism that makes the representation happen and there is an “effect of subjectivity.”57 These concepts recall the theory of “visual enunciation” that Marin elaborated based on Benveniste’s “written enunciation” ðBenveniste 1966, 1974Þ: in language, the effects of objectivity ð“narrative enunciation”Þ and subjectivity ð“discursive enunciation” Þ depend, among others, on the personal forms of the word “he” ðeffect of objectivityÞ as well as “I/you” ðeffect of subjectivityÞ and on the circumstantial demonstrative adverbs linked with them ð“that” for “he,” “this” for “I/you”Þ.58 Inside a work of art, for example, characters looking at us or pointing out something establish a relationship “I/you,” creating an effect of subjectivity. They also appear in the Triumph of Death, inside the space of the narration and inside the rhombus within the horizontal frames. These “figures of framing” build a second level of narration, guiding us to a deeper comprehension of the painting. First, the nine angels with scrolls inside the lower frame are painted at the height of the viewers’ gaze, establishing a dialogue with them. In particular, the one under the greyhound glances up, pointing out what to look at; his inscription builds a communication with the pronominal “you,” referring to the beholder and to the group of the hunters; one of the hunters is looking at us.59 The result of this connection is a visual and written communicative circuit. The same circuit, realized in different ways, concerns the three central angels of the lower frame. They gaze in our direction, but every mark of enunciation of their inscriptions is strikingly different. In fact, the verses on the scroll of the angel under the beggars echo the content of the one immediately above inside the narration, but in the frame the angel uses the sacred words of the Old Testament in Latin.60 While his eyes establish a discursive enunciation ðI/youÞ with the viewer, his scroll realizes a narrative enunciation ðheÞ, and his inscription brings to life a voice outside the narration. Looking directly at us, the following angel admonishes the beholder producing a discursive enunciation. Also, the third angel in the middle of the lower frame, just under Death, stares at us while holding a short inscription in Latin taken from the Old Testament: “Nobody knows when his hour will come.” Once again his voice is from outside the narration, and it properly refers to the indeterminable advent of Death, painted above. On a visual level “not knowing” the exact moment of its arrival, it corresponds to the representation of Death “getting on the point of using its scythe”: it is what we have called the inchoateness of the act of cutting down. The scroll of the eighth angel, under the group of people in the orchard, talks directly to one of the young ladies and to every woman of the audience ðyouÞ, warning against earthly sins.63 Unlike the three previous angels, this one is represented in profile, and the direction of his eyes, underlining the content of the inscription, guides us to the next fresco ðLast JudgmentÞ. This angel, like the one under the greyhound, has the same visual function as the demonstrative pronouns ðthis and thatÞ, because—just like the frame—he indicates to us what to look at. But the eighth angel guides us outside the framed scene of the Triumph of Death, and this unusual aspect finds explanation in the entire Buffalmacco cycle inside the Camposanto, that could be read just following a determined itinerary. We must remember here that the huge dimension of these scenes never permits an overall view.64 The painted frame by itself is not a guide to the eyes. In fact, in this cycle several “figures of framing,” play the same role as, for instance, the group of two cupids bringing a roll with a long inscription in the middle of the fresco, above the three central angels under the beggars and the heap of corpses. This group is another “figure of framing,” and just like the angels these cupids look at us: they are external to the mimetic dimension of the representation and they have a presentative function. The frame is a borderline between the representation and everything that does not concern it: denying the space of the outside it affirms the one of the inside. Nevertheless, looking at the frame by itself, it clearly appears like a composite space, neither internal nor external to the representation.65 Therefore, it is has a neutral status,66 which derives from the double negation inscribed in the mechanism itself: occupying the limit of representation, the frame articulates the spaces that prove its being ðMarin 1982Þ. The neutral status immediately refers to the perceptive dimension of the frame because it has to be gazed upon without being seen; but it also refers to an immanent dimension that concerns the logical relations activated by the frame itself. Buffalmacco’s frame explains very well the neutral status of the margin. It is a geometric squaring of the space of representation, so it has a different nature, but it was realized on the same wall and with the same technique. Its ambiguous status, neither internal nor external, is very evident. But today we can talk about it only on the basis of historical pictures, because most of the frames of the entire cycle got lost; indeed, it is interesting to note that the detachment saved just the privileged space of representation. This loss is still heavier if we think that inside the margin we could find “figures of framing” that gave us a metatheoretical interpretation of the fresco, disclosing to us to the moral and theological explanation of the scene. The comprehension of the whole meaning would not have been otherwise impossible without these elements, but the “figures of framing” and, in particular, their inscriptions permit a true exegesis of what was painted on this wall. Every inscription talks about the transcendence meant as a passage to a new life, hellish or heavenly, places of eternal salvation or damnation. But how did Buffalmacco translate this theological concept in painting? Looking at the fresco as it appears today ðfig. 14Þ, we are impressed by the figure of Death not just for its horrendous aspect, but first of all because of its central role in the middle of the scene. The main subject is not Death that inevitably cuts off every life, but the afterlife opened by the intervention of Death. This metaphysical space is displayed in the higher part, while episodes of the earthly world, with different phenomenal times, stay closer to the beholder. There is a very significant area that corresponds to the corridor created by the arrival of the woman with the scythe, connecting two semantic fields: /life/ and /nondeath/.68 This is the real meaning of the fresco, not the Triumph of Death but its consequences, not the act of dying but the process of transformation from /life/ to /nondeath/, from /low/ to /high/. Also, the personification of Death—half human and half devil—connects these worlds. Compared to other Italian Triumphs of Death, the Buffalmacco fresco highlights the role of the old woman as a go-between toward a new life. In a later fresco, today in the Museo di Palazzo Abatellis in Palermo ðca. 1446Þ, this personification is a skeleton riding a haggard horse ðfig. 15Þ: it is not flying and its earthly nature prevails.69 Remaining in Tuscany in the second half of the fourteenth century, in the church of San Francesco in Lucignano ðArezzoÞ there is another fresco representing a similar iconography, but Death here is an old woman with claws and long white hair, riding a black horse ðfig. 16Þ.70 She does not stay in midair, as in Pisa, because her horse brings her to the earth, and she pronounces terrible words.71 This fresco has several elements in common with the Buffalmacco painting—the beggars with their invocation to Death, the heap of corpses, two hunters—but we find a very important difference: Christ appears in the sky under the horrible woman. Pointing to her, Christ talks to the beholder in the vernacular and in rhyme: “Oh You, reader, pay attention to the blows of / This Lady that killed me / Since I am the Lord / Of her.”72 In the Pinacoteca of Siena there is a similar iconography of Death represented together with Christ, traditionally entitled Allegory of Redemption ðfig. 17Þ. It is a tempera on wood panel attributed to Ambrogio Lorenzetti, and scholars are convinced that the author of this little painting drew inspiration from the Buffalmacco fresco in Pisa, dating it at the middle of the fourteenth century ðFrugoni 2002Þ. Christ crucified above a heap of corpses dominates the scene, but over his head flies Death, represented as a black devil with bat wings. This is a very unusual composition: the devil overlooks the Son of God, and its scythe hovers just above his head. 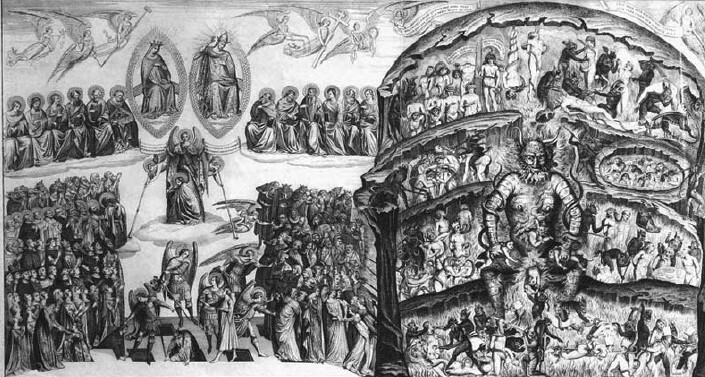 Moreover, Death appears at another time: the same devil with the scythe accompanies the first two sinners on the very left side of the background, under the Creation of Adam and Eve and the Original Sin. In the foreground we can recognize Cain and Abel ðthe first homicideÞ and two anchorites with a long scroll at the feet of the Cross. On the very right side Christ Judge, surrounded by angels, overlooks the Cross, between the Virgin and St. John, and, at the bottom, other angels are driving back the damned. Apparently the Lorenzetti narration is very different from that by Buffalmacco, above all for the presence of Christ. In Siena, the death of Christ is followed by his Ascension ðhis “triumph over death”Þ, the allegory of redemption that is possible to everyone who erases their sins. So the painting must be read from left to right: from the first sinners ðprehistoric timeÞ to the saved and the damned ðmetaphysical timeÞ, passing through the sacrifice of Christ on the Cross ðhistorical timeÞ. In this sense the Crucifixion functions as a gobetween from life to afterlife, the same role played in Pisa by Death. The monumental fresco in the Camposanto was adjacent to the Crucifixion and to the stories of Christ after death on the eastern wall ðfig. 6Þ. This sequence could hardly allow the faithful an interpretation of the whole cycle as an allegory of redemption. Moreover, our fresco can be freely read, or better, there is no direction from left to right but a leap in time in every episode, from phenomenal ðlowÞ to metaphysical ðhighÞ. And in Pisa, inside the space of narration, apart from the angels disputing the souls, divinities are not represented. Why? The answer remains in the frame: as related by Cosimo Bartoli, in the lower margin two inscriptions come from the Old Testament ðEcclesiastesÞ while in the higher margin two other verses refer to Abel and Cain: Cain was the first human born and Abel the first human to die, Cain committed the first murder by killing his brother, and Abel is often compared to Christ as being the first martyr.74 If we look more closely at the historical picture of the Triumph of Death, the third character with a scroll in the higher frame stands out from the others and seems to be the Redeemer, young and bearded, holding the palm of martyrdom. Also, the next character, older and with a longer beard, looks like a sacred figure, possibly God or a prophet. Confining the sacred to the “neutral” space of the higher margin, the Camposanto fresco privileges an earthly point of view. For this reason it is traditionally called Triumph of Death, but it would be more appropriate to rename it—in comparison with the Lorenzetti painting—Allegory of Redemption.